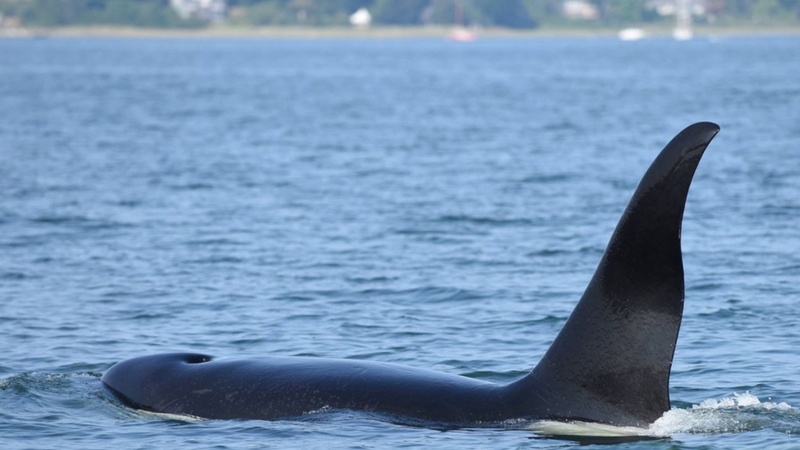 A killer whale that made headlines for overstaying its welcome in Comox Harbour has finally headed for deeper waters, according to the Department of Fisheries and Oceans. The male transient or Biggs killer whale known as TO73B arrived in the harbour last week, far from its usual splashing grounds off the coast of Alaska. Researchers called it a rare occurrence, but said this particular whale had a habit of stopping in harbours for longer than usual. Video captured on Sunday showed the orca pushing around a moored sailboat in the harbour and into another vessel, prompting concern among whale experts. Worried about the orca's atypical behaviour, researchers at the DFO hatched a plan to lure it out of the harbour on Thursday. DFO marine mammal coordinator Paul Cottrell said the team decided to use underwater playback calls of other Biggs killer whales familiar to TO73Bto try to entice it further up the coast. "There was an immediate reaction when we did the playback," Cottrell said. "The response from the animal was very strong." Over an hour-long period, DFO crews watched as the animal swam out of the harbour and through a shallow area off Cape Lazo before it finally headed for deeper waters further north. "He was visibly excited by those sounds and that's what basically got him out of there," said DFO whale researcher Jared Towers. The crew emphasized that the recording of whale sounds played back to the orca was done under licence, because if not done appropriately, some animals can respond aggressively. The DFO says it's hoping the animal continues to move on, but it will keep monitoring to make sure it doesn't return. It's still unclear on what attracted the whale to the region in the first place. "In this case, we're just happy we got this animal out of here before anything bad happened to him," said Towers. The DFO says there have only been four other recorded occurrences since the early 1980s of lone killer whales apparently choosing to stay in one spot. The operation was considered an unprecedented one in B.C., with DFO officials saying it has only been done once before, but never with an adult killer whale.